My older two sons are crazy about the video game Fortnite. This morning, they were going on and on about the release of season six, which happens today. Me? I’m more of a tabletop game kind of person. My current favorite is the classic, Ticket to Ride. I also really like Pandemic, for a more cooperative style game. How about you? What games (video or analog) do you play? Are there any games you recommend for architect/engineer types? Share your thoughts and leave a comment below! That looks pretty interesting. I’ll have to check it out. I wonder what a 3D version of it would look like? The boards would be simple enough (or as elaborate as you wanted) to model. There are whole communities online devoted to 3D printing upgrade pieces for board games. I’ve seen this game at my local game store. It looks cool plus what’s not to like about a game about skyscrapers. Thanks for the reminder. I’ll have to pick it up and give it a try. A personal favorite of mine is called Concept (https://www.amazon.com/Asmodee-CONC01-Concept/dp/B00IDB6J0S), which is a guessing game akin to Pictionary. The difference is instead of directly drawing or gesturing the clue players have to explain the clue through concepts, often leading to multiple concepts to explain a more challenging clue. I really enjoy this game because it helps me to challenge the way I think. I find myself analyzing how other people playing the game think in order to guess the clue, which has helped me to expand my thinking in design as well. Just ordered it! Thanks for the suggestion. that said, monopoly have just released a new version of monopoly, cheaters edition, which encourages game constrained cheating, and its quite fantastic, makes regular monopoly look terrible. its quicker to finish and everything has been thought of to make the game constantly interesting with every move. I have to confess. . . I hate monopoly. It’s too long and the gameplay gets boring down the stretch. When my kids suggest it, I steer them to something else. But this! This is the Monopoly I want to play! Another game added to add to my collection. Thanks Mitchell! Ticket to Ride is a good one. For table top games; Chess is my go-to. As for the digital world; SimCity is the ultimate game for architects. However there is another that is similar but for the life of me I can’t place the name. For the engineering gurus you should absolutely check out Kerbal Space Program. The premise is simple – build a rocket, get to space and beyond. But it’s not that easy – it actually is challenging. Yes! This format is keeping my inbox much cleaner. Plus, it’s more fun the have the conversation in “public”. Thanks for the reminder about Kerbal Space Program. I downloaded it a while back but never got into it. I was trying to remember the name because it was very cool (but very daunting). 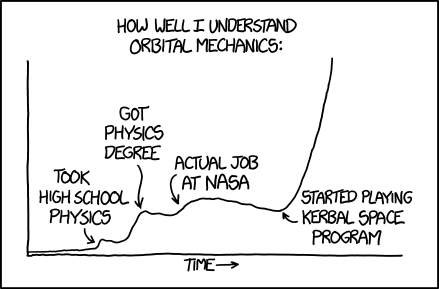 I remember this cartoon I saw, that pretty much summed it up (https://imgs.xkcd.com/comics/orbital_mechanics.png). Not sure I’ll ever understand orbital mechanics though. . .
I’m surprised no one has said it yet, but minecraft is low hanging fruit to recommend to architects. We had a private server set up in college and 4 of us shared a map in the game and had some pretty cool projects going. Really great as a creative outlet. I’m also a big fan of chess. My girlfriend and I wind down from a stressful day with some wine, some jazz and a game or two of chess. Really puts my mind in the right place. My kids loved Minecraft but sadly, I never got into it. If it had been around when I was younger, I’m pretty certain it would have consumed MUCH of my free time. Can’t go wrong with chess. I used to play a lot in college. My roommate had a “teach yourself chess” set and we’d play every night.